Objectives We evaluated the sensitivity, specificity and positive and negative predictive values of elevated serum IgG4 concentrations for the diagnosis of IgG4-RD. Methods Between 2001 and 2011, 190 unique patients had elevated serum IgG4 measurements. We reviewed electronic medical records to determine the indication for IgG4 measurement and underlying clinical diagnosis. Additionally, we reviewed the records of 190 other randomly selected patients from a pool of 3360 with normal results, to evaluate test characteristics of the IgG4 measurement. Results Among 380 patients analysed, 72 had either probable or definite IgG4-RD. Sixty-five of the 72 IgG4-RD patients had elevated serum IgG4 concentrations (mean: 405 mg/dL; range 140–2000 mg/dL), for a sensitivity of 90%. Among the 308 subjects without IgG4-RD, 125 had elevated IgG4 (mean: 234 mg/dL; range 135–1180 mg/dL) and 183 had normal IgG4 concentrations, for a specificity of 60%. The negative predictive value of a serum IgG4 assay was 96%, but the positive predictive value only 34%. Analysis of the serum IgG4/total IgG ratio did not improve these test characteristics. Doubling the cutoff for IgG4 improved specificity (91%) but decreased sensitivity to 35%. Discussion Multiple non-IgG4-RD conditions are associated with elevated serum IgG4, leading to poor specificity and low positive predictive value for this test. A substantial subset of patients with biopsy-proven IgG4-RD do not have elevated serum IgG4. Neither doubling the cutoff for serum IgG4 nor examining the serum IgG4/IgG ratio improves the overall test characteristics for the diagnosis of IgG4-RD. IgG4-RD (IgG4-RD) is a fibroinflammatory disorder involving numerous organ sites including the pancreas, retroperitoneum, salivary glands, lungs, kidneys, lymph nodes and others.1 ,2 Nearly every organ, with the exception of the brain parenchyma, has been reported to be affected by IgG4-RD. The diagnosis of IgG4-RD relies heavily on the histopathologic characteristics of biopsy specimens, including a lymphoplasmacytic infiltrate enriched with IgG4+ plasma cells, storiform fibrosis, obilterative phlebitis, and a mild to moderate tissue eosinophilia.3 Serum IgG4 concentrations are often considered useful in rendering the diagnosis, in determining responsiveness to therapy, and in predicting the need for future treatment.4 However, studies of the test characteristics of serum IgG4 concentrations have often been small, focused on single-organ systems (particularly the pancreas),5–8 or characterised by insufficient clinical and pathological detail about the subjects. We therefore aimed to assess the usefulness of serum IgG4 concentrations for the diagnosis of IgG4-RD among patients with a wide variety of organ involvement at an academic medical centre in the USA. This investigation is the first to assess the clinical usability of serum IgG4 levels systematically in a study population enriched by large numbers of patients with systemic (as opposed to single-organ) IgG4-RD. We evaluated the sensitivity, specificity and negative and positive predictive values for the diagnosis of IgG4-RD among a group of 190 subjects with elevated serum IgG4 concentrations and 190 subjects with normal serum values. We also assessed the most common diseases leading to a serum IgG4 level of >135 mg/dL, and the frequency with which patients without diagnoses of IgG4-RD had serum concentrations of more than two times the upper limit of normal. Finally, we compared the usefulness of calculating serum IgG4 with total serum IgG (IgG4/IgG) ratios to the usefulness of assessing the serum IgG4 concentration alone. The diagnosis of IgG4-RD was made according to an international pathology consensus guideline.3 The diagnosis of definite IgG4-RD was rendered if a patient had a tissue biopsy that met at least two of the three major histopathologic features of the disease: a lymphoplasmacytic infiltrate, storiform fibrosis and obliterative phlebitis.3 Additionally, immunostaining studies of patients’ biopsy samples had to demonstrate >10 IgG4+ plasma cells per high power field (HPF) and an IgG4/IgG ratio >40% in order to meet criteria for a definite IgG4-RD diagnosis. Subjects were labelled as having probable IgG4-RD if they had never undergone a tissue biopsy but had typical IgG4-RD organ involvement and a typical IgG4-RD radiographic appearance of those affected organs. Total IgG and IgG subclasses (IgG1, IgG2, IgG3 and IgG4) were measured by nephelometry, using a Siemens BNII instrument and reagent sets obtained from either Siemens or The Binding Site. These assays were performed at the Mayo Medical Laboratories (Andover, Massachusetts). Unpaired t tests were used for the analysis of serum IgG4 levels and IgG4/IgG ratios, and χ2 test for gender differences. The mean age of the entire patient cohort was 48±17 years. Fifty-four percent were women and 46% were men. In considering the gender distribution among the group with elevated versus normal serum IgG4 concentrations separately, however, an interesting difference was observed. Among the 190 subjects with elevated serum IgG4 concentrations, there was a male predominance: 56% men and 44% women. By contrast, the normal serum IgG4 group demonstrated a female predominance: 63% women and 37% men (p=0.009). Moreover, the average serum concentration was greater in the men with elevated serum IgG4 concentrations than in the comparable group of women. The mean serum concentration among the men was 348 mg/dL (range 135–2000 mg/dL), compared with 214 mg/dL (range 137–585 mg/dL) among the women (p<0.001). Only three (11%) of the 27 patients with definite IgG4-RD diagnoses were women, but 21 (55%) of the 38 patients in the probable IgG4-RD group were female. The different clinical diagnoses associated with elevated serum IgG4 concentrations are shown in figure 1. Definite (n=27) and probable (n=38) IgG4-RD were the most common diagnoses, accounting for 34% of those subjects with elevated serum IgG4 concentrations. Among the patients with probable IgG4-RD, biopsies were not performed for a variety of reasons, the most common of which was radiologic findings (typically a diffusely enlarged, sausage-shaped pancreas with an enhancing rim on CT) that was typical of IgG4-RD—usually type 1 autoimmune pancreatitis—in the setting of a classic clinical presentation (see online supplementary table S1). Other common diagnoses included chronic sinusitis (n=46) and recurrent pneumonia (n=29) (table 1). 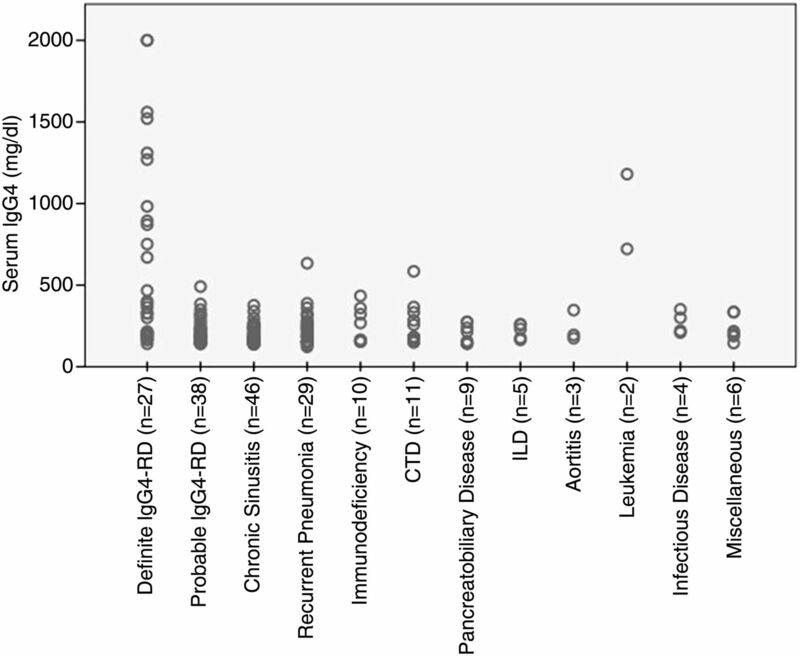 Systemic autoimmune conditions, such as Sjögren's syndrome and mixed connective tissue disease, as well as pancreaticobiliary disease, were also prominent among the diagnoses of subjects with elevated serum IgG4 concentrations. Diseases associated with elevated serum IgG4 levels are shown. 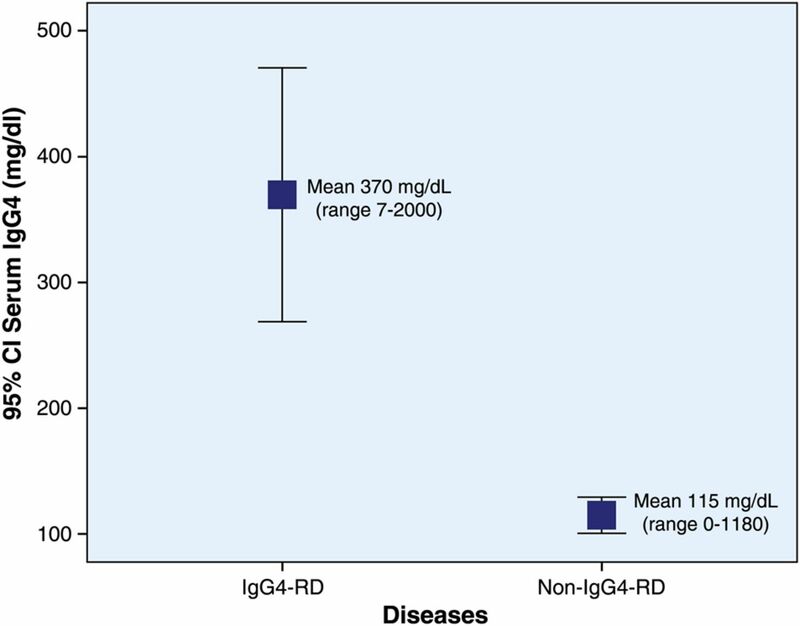 Each group of diseases with serum IgG4 >135 mg/dL is represented on the x-axis. Each patient in the group is represented by an individual circle with their corresponding serum IgG4 level. The diseases included in each group are detailed in table 1. The sensitivity of the serum IgG4 concentration for the diagnosis of either definite or probable IgG4-RD was 65/72, that is, 90% (table 2). The mean IgG4 serum level for those patients with either definite or probable IgG4-RD was 405 mg/dL (range 7–2000 mg/dL), but there was a marked difference in serum concentrations between those with definite diagnoses (mean 670 mg/dL; range 12–2000 mg/dL; SD±585 mg/dL) and probable diagnoses (217 mg/dL; range 7–491 mg/dL; SD±76 mg/dL) (table 3). There was a significant serum IgG4 concentration difference between patients with IgG4-RD (370 mg/dL (range 7–2000 mg/dL)) and all others (115 mg/dL (range 0–1180 mg/dL))(P<0.0001) (figure 2). Among the patients with definite diagnoses of IgG4-RD, only three (10%) had normal serum IgG4 concentrations. The CIs of all patients with IgG4-related disease were compared with all patients with any other diseases (p<0.0001, unpaired t test). Six of the seven IgG4-RD patients with normal serum IgG4 values were on prednisone (mean dosage 20 mg/day; range 7.5–60 mg/day) and some of these were receiving additional immunosuppressive medications, as well: azathioprine (n=2), tamoxifen (n=1), or gemcitabine (n=1). In the elevated serum IgG4 group, 12 (19%) of the 65 IgG4-RD patients were on immunosuppressive treatment. The equivalent mean prednisone dosage among those on treatment was 25 mg (range 5–103 mg). Other immunosuppressive or immunomodulating agents included infliximab (n=1), hydroxychloroquine (n=1), methotrexate (n=1), and certolizumab (n=1). The specificity and positive predictive value of elevated serum IgG4 concentrations were 60% (183/309) and 34% (65/190), respectively. The values of these test characteristics were lowered by the high frequencies of elevated serum IgG4 concentrations among patients with non-IgG4-RD diagnoses. However, the mean serum IgG4 concentration in subjects with definite IgG4-RD—604 mg/dL (range 12–2000 mg/dL)—was significantly higher than that of subjects with non-IgG4-RD diagnoses (mean: 20 mg/dL; range 1–1180 mg/dL; p<0.0001). The negative predictive value of a normal serum IgG4 concentration for the diagnosis of definite and probable IgG4-RD was 96% (183/190). All seven patients who had IgG4-RD but normal serum IgG4 concentrations had clinical involvement of one organ alone. Forty-one patients with single-organ disease had elevated serum IgG4 concentrations, but the mean IgG4 level among patients with multiorgan disease was higher compared with those with single-organ disease (699 mg/dL (range 146–2000 mg/dL) vs 233 mg/dL (range 140–670 mg/dL) respectively; p<0.00005). Because of the large number of non-IgG4-RD diagnoses that were found to be associated with elevated IgG4 concentrations, we evaluated the test characteristics of a cut-off value for the upper limit of normal for the serum IgG4 assay that was two-fold higher, that is, 270 mg/dL. With this higher cut-off value, the sensitivity, specificity and positive and negative predictive values of the serum IgG4 assays were 35%, 91%, 48% and 86%, respectively (table 2). Thus, the higher specificity derived from doubling the cut-off value for serum IgG4 concentrations came at a significant sacrifice in sensitivity. Other investigators have reported that an elevated IgG4/IgG ratio is useful in distinguishing IgG4-RD from other conditions. We investigated this measure using a ratio >0.08 as the cut-off for normal. The mean IgG4/IgG ratio in the IgG4-RD patients was 0.20±0.2 versus 0.09±0.09 in the non-IgG4-RD patients (p<0.00002), but the sensitivity, specificity and positive and negative predictive values of the serum IgG4/IgG ratio were 86%, 59%, 33% and 95%; that is, not improved over those of the serum IgG4 concentration alone (table 2). IgG4-RD was identified as a distinct systemic disease only a decade ago and recognition of this condition has grown quickly in recent years.10–12 Although many of the pathophysiologic details of this condition remain to be elucidated, the sine qua non of this diagnosis is pathology, that is, the characteristic histopathological features and the infiltration of high numbers of IgG4-bearing plasma cells into the tissues of involved organs.3 Elevated serum IgG4 concentrations are linked tightly with the diagnosis of IgG4-RD in the minds of many clinicians even though it is well established that a significant proportion of patients with biopsy-proven IgG4-RD have normal serum IgG4 concentrations.13 Failure to understand the test characteristics of serum assays for IgG4 and to employ them effectively in clinical practice can lead to overdiagnosis and delays in diagnosis. Few studies have focused upon the diagnostic usefulness of serum IgG4 concentrations, and nearly all such studies in Japan and the rest of the world have been limited to patients with autoimmune pancreatitis (AIP). This study is the first in a North American population to analyse the test characteristics of serum IgG4 concentrations for the diagnosis of IgG4-RD in a group of patients that is enriched for patients with multiorgan as opposed to single-organ disease. We found that the sensitivity and the negative predictive values of elevated serum IgG4 concentrations are high for the diagnosis of IgG4-RD: 90% and 96%, respectively. Reliance upon serum IgG4 concentrations for establishing the diagnosis of IgG4-RD is highly problematic, however, because of the multiple non-IgG4-RD conditions that can be associated with elevated serum IgG4 concentrations. This fact is reflected in the poor specificity (60%) when the conventional cut-off for the upper limit of normal for serum IgG4 concentrations is employed. Although the highest mean serum IgG4 concentrations occurred in subjects with definite IgG4-RD diagnoses, substantial elevations of serum IgG4 levels also occurred frequently in patients with non-IgG4-RD diagnoses, particularly in haematologic malignancies. In fact, 22% of the patients with non-IgG4-RD diagnoses in this study had serum IgG4 concentrations greater than two times the upper limit of normal. Doubling the cut-off value for serum IgG4 to 270 mg/dL improved the specificity from 60% to 91%, but did so with an unacceptable reduction in sensitivity, from 90% to 35%. The results of this study differ significantly from a study performed in the USA that focused on patients with AIP. Ghazale et al6 studied 510 patients with various pancreatic diseases, of whom only 45 had AIP. The sensitivity and specificity was 76% and 93%, respectively. The results of that study illustrated that IgG4 concentrations in blood are inadequate for the purpose of differentiating type 1 (IgG4-related) AIP from pancreatic cancer. The lower sensitivity in the study by Ghazale et al probably relates to an enrichment of patients with single-organ disease, namely AIP, even though patients with multiorgan disease were not excluded. Another possible explanation for ‘false-negative’ serum IgG4 concentration measurements and lowered sensitivity of this test in some settings is issues with IgG4 assay, including the prozone effect.13 We have previously identified that in the setting of dramatic antigen excess (ie, extremely high serum IgG4 concentrations), nephelometry assays do not measure serum IgG4 assays accurately if the sample has not been diluted appropriately. The assay now employed by our laboratory guards against the prozone effect by serial dilutions of the serum sample until stable measurements are achieved. Our findings support the concept that fundamental differences may exist in the baseline serum IgG4 concentrations between males and females. Among the patients with definite IgG4-RD diagnoses, the 11 highest serum IgG4 concentrations were observed in men. These results are consistent with the small quantity of data with regard to this question in the literature and raise interesting questions for further exploration. Among these is the potential for gender differences in the expression of IgG4-RD. Our study has important strengths. First, we employed rigorous, consensus-based criteria for the diagnosis of definite and probable IgG4-RD.3 Second, this study is the first involving a North American population to focus upon multiorgan IgG4-RD as opposed to single-organ disease alone. Third, all the patients in this study were identified from the same pool of patients who underwent testing for serum IgG4 concentrations at our centre over a 10-year period. The clinical diagnoses and indications for testing were confirmed in all subjects. Our study also has certain weaknesses, namely the significant possibility that the diagnosis of IgG4-RD was under-recognised during the period of study. This possibility is a potential hindrance to all studies of the epidemiologic features of IgG4-RD and the value of diagnostic tests. Under-recognition of the diagnosis of IgG4-RD would be anticipated to lower the specificity and the positive predictive value of elevated serum IgG4 concentration measurements. A second potential weakness is the fact that practice patterns with regard to test ordering during the period of this study may have affected some of the results. As an example, we suspect that the enrichment of cases of chronic sinusitis and recurrent pneumonia among the group of patients with elevated serum IgG4 concentrations stems from the fact that such patients often undergo evaluations for immunodeficiencies in the form of IgG subclass deficiencies. The possibility that some of these patients with chronic sinusitis and recurrent pneumonia actually had IgG4-RD is difficult to exclude in retrospect. This possibility would be expected to lower the positive predictive value of an elevated serum IgG4 measurement. In conclusion, the sensitivity and the negative predictive values of elevated serum IgG4 concentrations for the diagnosis of IgG4-RD are high. However, multiple non-IgG4-RD conditions can be associated with elevated serum IgG4 concentrations, with the result that the specificity and the positive predictive value of elevated IgG4 levels are low. Neither doubling the cutoff for serum IgG4 concentration nor examining the serum IgG4/IgG ratio improves the overall test characteristics of serum IgG4 assays. The optimal use of serum IgG4 concentrations at this time is as an initial diagnostic test that offers important support of an IgG4-RD diagnosis if positive, as well as a significant argument against the diagnosis if negative. Regardless of the serum IgG4 concentration measurement, however, the gold standard for diagnosis in most cases remains biopsy of an involved organ and close clinicopathologic correlation of the findings. The identification of additional diagnostic markers of IgG4-RD in peripheral blood is an important agenda for future investigations.
. Consensus statement on the pathology of IgG4-RD. Mod Pathol 2012;64:3061–7.
. Serial changes of elevated serum IgG4 levels in IgG4-related systemic disease. Intern Med 2011;50:69–75.
. High serum IgG4 concentrations in patients with sclerosing pancreatitis. N Engl J Med 2001;344:732–8.
. Value of serum IgG4 in the diagnosis of autoimmune pancreatitis and in distinguishing it from pancreatic cancer. Am J Gastroenterol 2007;102:1646–53.
. Evaluation and management of autoimmune pancreatitis: experience at a large US center. Am J Gastroenterol 2009;104:2295–306.
. Cutoff values of serum IgG4 and histopathological IgG4+ plasma cells for diagnosis of patients with IgG4-related disease. Int J Rheumatol 2012;2012:580814.
. IgG4-related sclerosing disease: a critical appraisal of an evolving clinicopathologic entity. Adv Anat Pathol 2010;17:303–32.
. IgG4-related disease: nomenclature, clinical features, and treatment. Semin Diagn Pathol 2012;29:177–90.
. Prozone phenomenon leads to low IgG4 concentrations in IgG4-related disease (Abstract 2527). Arthritis Rheum 2012;64:S1067.
. IgG4-RD: a cross-sectional study of 114 cases. Am J Surg Pathol 2010;34:1812–19. Contributors All authors contributed to the following: substantial contributions to the conception or design of the work; or the acquisition, analysis, or interpretation of data for the work; drafting the work or revising it critically for important intellectual content; final approval of the version to be published; agreement to be accountable for all aspects of the work in ensuring that questions related to the accuracy or integrity of any part of the work are appropriately investigated and resolved. Ethics approval Partners Institutional Review Board.